Chelsea winger makes his first step up to the England seniors. Callum Hudson-Odoi has received a call up to Gareth Southgate's England squad for the forthcoming Euro 2020 qualifiers. The 18-year-old had only just been drafted in for Aidy Boothroyd's U21s in their games against Poland and Germany. The Three Lions face Czech Republic at Wembley Stadium on Friday 22nd March 2019 before travelling to Podgorica City Stadium to take on Montenegro on Monday 25th March 2019. Hudson-Odoi had been training with Boothroyd's U21 set-up in Bristol and was set to make his debut against Poland, but is now extremely excited to join up with Southgate's Lions at St. George's Park after Luke Shaw's withdrawal. He told the national team's Twitter: “It’s been a crazy day but getting my first [senior] international call-up is an amazing feeling. “Today has been a very long day for me because I had to travel to Bristol first for the U21s and then getting told that I have to come over here to St. George’s Park, it’s been a crazy experience but I’m delighted to get the call. “I thought the manager [Aidy Boothroyd] was joking. I was shocked and then when I heard that I actually had to go over, I couldn’t believe it. "I was delighted. It’s a dream come true. Now I’ve got to work hard, enjoy every moment and keep working to just hopefully make an impact when I get the opportunity. Hudson-Odoi has emerged through the Chelsea ranks and into the limelight over the past two seasons. After starting against Manchester City in the Community Shield in August 2018, the Blues starlet's stock has risen dramatically - so much so that Roman Abramovich rejected a £40 million offer from Bayern Munich in January. This term, the young attacker has made 19 appearances for his club, scoring four Europa League goals and one in the FA Cup. Now with these two upcoming fixtures, the 18-year-old could surpass Glen Johnson, Jimmy Greaves and Ray Wilkins in becoming the youngest Chelsea player to play for the England senior team - if he wins a cap. It isn't a surprise to see yet another U17 World Cup winner follow in Jadon Sancho's footsteps. In 2017 the Young Lions, which included both Sancho and Hudson-Odoi, went all the way to lift the trophy in India. The latter featured in every game and assisted three of the five goals in that memorable final against Spain. This tournament completed a fantastic year for the youngster in which he also contributed significantly towards winning the U18s Youth Cup and U18 Premier League. 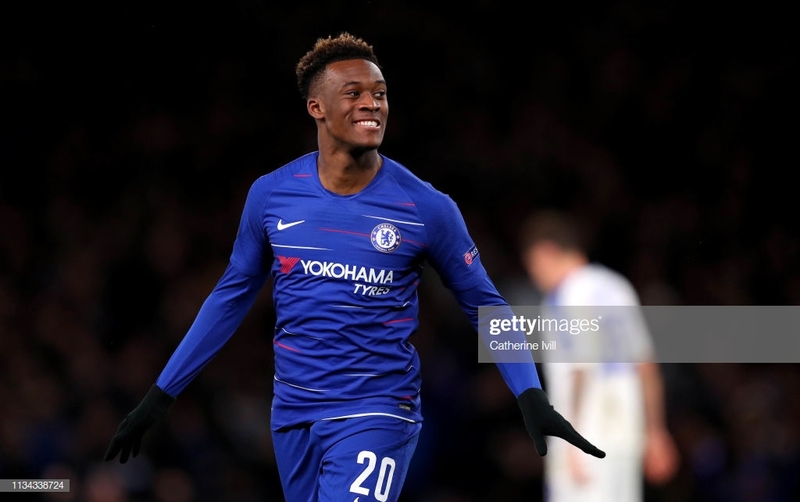 Hudson-Odoi and Chelsea also retained both of these titles the very next season.